Neoclassical economics tends to classify goods in four groups: private and public goods, club goods and common goods. Anyone attempting to apply this classification in order to organize real-world objects will achieve one thing above all: their own confusion. So, in the classification of goods mentioned above, common goods are considered rival. They are joined by another category: excludability. According to the theory, common goods are characterized by being non-excludable. Much of commons research concurs with this position. For instance, we all indeed have the right to access sufficient quantities of clean drinking water. This right is derived from human rights. From a normative viewpoint, it is therefore difficult to exclude people from using drinking water. But technically speaking, in contrast, it is fairly easy to exclude them. All it takes is refraining from investing in water supply and sewerage, and sealing or privatizing springs or wells, and then bottling the water in containers and selling it at prohibitive prices or making people depend on tank trucks. In fact, roughly three billion people do not have access to clean drinking water! This example shows that depending on the degree of excludability, drinking water can become any kind of good: common to all of us, private, public or reserved for an exlusive club. We determine the form of use and thereby also the classification of drinking water as a particular type of good – yet we have apparently lost sight of this fact in a gradual process of ontologization. The term ontology stems from the Greek participle “on” (being) and “logos” (science or study) – in other words, it denotes the study of being and refers to the fundamental constitution of things. According to landscape architect Frank Lorberg, “the human history of things disappears” in a process of ontologization, for it describes the shifting of man-made circumstances into the sphere external to us. Circumstances that invariably emerge in concrete social situations are separated from their historical contexts,1 and in the end seem inscribed in that which we encounter. In short: they become reified. Philosopher Annette Schlemm considers ontologizations to be “reductions of circumstances that are in flux or of things that exist in relationships merely to reified substances” (Schlemm 2011). Everything appears as if it has always been like it is, for over the course of time, people consider things to be natural that in fact evolved historically and were produced by society – jumping to theoretical conclusions, as it were. This process can also be observed in the neoclassical classification of goods. Theoretically determining common goods as rival and not excludable will, at best, make experts of the global drinking water situation utter a disillusioned “if only!” “Rival”? Yes, at least more or less. Canada is different from the Sahel. But “not excludable”? This linkage was successful. To this day, what economists call a “public good” is usually given over to the state. Other institutions are disregarded. The linkage seems imperative and natural, even though the two parts certainly can be separated, and indeed must be separated from one another. Samuelson was aware of the complexity of his search for the optimal (state) formula for allocation. “The solution ‘exists,’” he stated, “the problem is how to ‘find’ it.” (Samuelson 1954) And even then, there could still be free riders who enjoy the common goods without contributing anything in return. This is a problem for sociology, he stated in capitulation, sounding as resigned as an impassioned mathematician reaching the limits of the calculable. Another sensation followed eleven years later: James McGill Buchanan, also a Nobel laureate, published his article “An Economic Theory of Clubs.” (Buchanan 1965) It, too, is short and succinct. “No general theory has been developed which covers the whole spectrum of ownership-consumption possibilities” (ibid., 1). Instead, research remained limited to private or public goods – even though hardly any goods displayed the characteristic of “extreme collectiveness” ascribed to public goods; de facto, practically everything was located somewhere between the two extremes. Therefore, Buchanan proposed “to drop any attempt at an initial classification or differentiation of goods into fully divisible and fully indivisible sets” and tried to develop a theory of goods with “some ‘publicness.’” (Buchanan 1965, emphasis added) He called them “club goods.” It was not “one user” or “the public” who accessed them, but a group of users. Thus, their utility for an individual depended on the number of people involved. From then on, club goods belonged to the established categories of goods. Buchanan concluded that the core of the debate about goods was about “the sharing arrangements”–be they organized by the state or cooperatively.5 Accordingly, he did not seek the optimal formula for governmental provision and distribution, but the optimal formula for all those situations in which a limited group of people uses something jointly. He described one of his basic assumptions using the example of a country club. The rule “the more members, the lower each individual’s membership fee” is valid only up to a certain size. If the club grows larger, it gets overcrowded, just like a traffic jam on a highway. Take an example of a “public good”: a dike. It is considered indivisible, as the utility of the residents on one side of the river does not diminish the utility of the residents on the other. Therefore, its degree of rivalry is zero. In addition, a dike protects everyone, just as a lighthouse shines the way for everyone, regardless of whether they are taxpayers or not. This technical (or normative) difficulty of excluding someone from using a good, is, as seen above, a characteristic of public goods. Yet a dike could also be built by private companies, part of the costs could be apportioned to the local residents, and anyone in arrears could be excluded from flood insurance. What matters is what happens in practice. In other words, excludability depends on the concrete circumstances, on what we as acting individuals are capable of doing, and on our decisions. We could also express this idea as follows: a common good does not have the characteristic of non-excludability; rather, it is given this characteristic. There is hardly a more telling illustration of this notion than that of US cartoonist Matthew Groening, creator of “The Simpsons.” The Simpsons live in a curious small town called Springfield. Electricity for the town’s population and factories, including one for amphibious vehicles, is supplied by an atomic power plant owned by the ruthless billionaire Charles Montgomery Burns. Burns’s heart – this I learn from the (German-language) Simpsonspedia – is “black and shri­veled.” Small wonder. After all, he has an intense aversion to the sun, which supplies Springfield’s population with energy free of charge. In the first part of the famous two-part episode “Who Shot Mister Burns?” the groundskeeper of Springfield’s school strikes oil. Everyone is delighted – except for Mr. Burns. He darkens the sun, making sunlight excludable. The theory of goods has become considerably more differentiated since the 1960s. Today, we speak of a continuum of goods, a number of subcategories have been added – pure and impure public goods, free goods and many more. Yet this has hardly contributed to a conceptual reorientation. Samuelson’s logical leaps have remained, as has the practical invisibility of human history in the things we analyze. The confusion on the part of people who want to place real things in the table shown above continues as well. If we try to allocate the various resources currently labeled as commons according to the criteria of “rivalry” and “non-excludability,” we get mired down in differentiations. In the commons debate, both natural and depletable things such as water, land and forests and renewable, social and cultural things such as seed, algorithms, software, public space or the electromagnetic spectrum are considered as being owned jointly by a group of people – not because of their characteristics in the neoclassical sense, but simply because they are elementary to our lives. The way in which resources are made accessible to society also defines them as common resources. Either we inherited them, or we produced them collectively, often over the course of centuries. That is what makes things common to us, not their alleged characteristics. That is why they are considered common goods and not private goods. Whether we make apples, water and knowledge common goods is up to us. The degree of rivalry is relevant when it comes to common rules for access and use. It results in different conventions. In the case of rival goods, restrictions to access are necessary – individuals are permitted to pick only the amount from a tree that they can carry in their hands.7 In the case of non-rival goods, only open access guarantees their development to everyone’s greatest benefit.8 Unlimited access does not destroy them! Excludability, in contrast, is mostly produced by social processes. It is up to us whether we make apples (or more precisely, apple trees) common goods or whether access to apples always has to take the detour via the market. It is only this decision that determines whether they are to be allocated to the group of common goods, or club goods or private goods. That is why we can confidently view the proverbial classification of goods from a respectful distance. We can “sublate” it in the Hegelian sense, which means set it aside, retaining what is useful and developing it further at a new level. Above all, however, we can turn our attention to the question of what we want to do with our common resources. That is what really matters, for common goods exist only if we produce them – and they will remain only if we take care of them. Buchanan, James M. “An Economic Theory of Clubs.” Economica, New Series, 32/125 (Feb., 1965), 1-14. Engel, Christoph. 2002.Die soziale Funktion des Eigentums. In von Danwitz, Depenheuer, Engel: Bericht zur Lage des Eigentums. 9–107. Lorberg, Frank. 2007. Metaphern und Metamorphosen der Landschaft. Die Funktion von Leitbildern in der Landespflege. Notizbuch der Kasseler Schule, Bd. 71. Hrsg. : AG Freiraum und Vegetation. Samuelson, Paul A. 1954. “The Pure Theory of Public Expenditure.” The Review of Economics and Statistics. (36)4:387–389. 1. 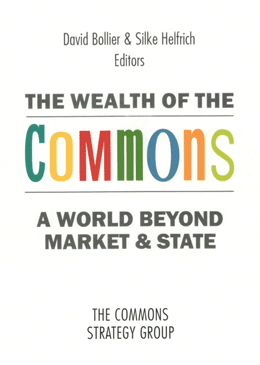 For more on the historical concept of the commons, see Hartmut Zückert’s essay. 2. See James B. Quilligan’s essay on the differences between public goods and common goods. 3. See the essay by Friederike Habermann. 5. Ibid, p. 4. Buchanan relates this idea only to things that are used as economic goods. He believes that voluntary sharing does not belong in this category. 6. For example, optimal group size and appropriate rules of use. 7. See Katharina Frosch’s essay about a Web-enabled commons for fruit-picking. 8. See the essays by Mike Madison et al. and Rainer Kuhlen. Silke Helfrich (Germany) is an author and independent activist of the commons. She is founding member of Commons Strategies Group. She was regional representative of the Heinrich Böll Foundation in Mexico/Central America for several years, and was the editor of Wem gehört die Welt, and translator and editor of Elinor Ostrom: Was mehr wird, wenn wir teilen. She blogs at http://commonsblog.de.